First of all, as expected, Sony doesn’t propose a classic DSLR but uses its “translucent mirror” technology to enable the light passing through the lens to reach the image sensor and the auto-focus sensor simultaneously. In addition to reducing camera size, this technology enables full-time phase-detect auto-focusing and a high continuous shooting speed—up to 12 fps in full resolution. But the main innovation that everybody was looking forward to seeing in action is the 24-megapixel APS-C sensor. Sony had already shaken the industry when they were able to fit 16 MPix on an APS-C-sized sensor while offering a high level of quality comparable to the acclaimed Sony SLT A55, Sony NEX C3, Pentax K5 and Nikon D7000. Now they’ve managed to put 50% more pixels on the same surface. But in doing so, did they end up compromising the image quality—in particular the level of noise (excellent on the 16 MPix version)? Let’s check out the effect on image quality by comparing the SLT A77 with the SLT A55 and the Alpha 580. As we can see in the comparison, this low-light score is very similar to that of the A55 (818), proving that Sony managed to keep the same excellent level of noise despite the reduced size of each pixel on the sensor. We also point out that at ISO 50 and ISO 80, the Sony A77 can make simply stunning images thanks to its very good dynamic range and color depth. 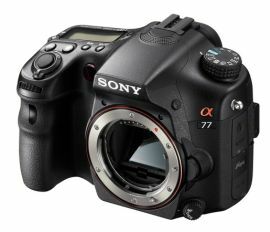 Let’s see how the Sony A77 compares with its competitors, the semi-professional DSLRs from Nikon and Canon. In this category, the very good EOS 7D seems a bit behind now, suggesting that now could be the right time for Canon to introduce a successor. The comparison with the Nikon D7000 is similar to that for the Sony Alpha 580, as they both use the same Sony sensor. Now let’s see how the Sony A77 compares with the bigger sensors of the full-frame cameras. Apart from a lower low-light ISO score due to its translucent mirror, the Sony A77 comes very close to matching these full-frame cameras. This demonstrates that even if the full-frame format dominated the high-end market when launched, they have now lost a big part of their advantage. They are closely followed if not overtaken by the best APS-C cameras (of which the Sony SLT A77 is one). So it may also be time for this category to develop new models to take advantage of the latest sensor technologies. In conclusion, thanks to its capacity to take innovation ever further and to break the limits of sensor design, Sony is about to bring on the market a very good semi-professional camera body. The next question is the capacity of the accompanying lenses to address the challenge of these very small pixels. The DxOMark lens measurements should give us an answer very soon. Last but not least, as the same sensor will be used by the Sony A65 and the Sony NEX 7, we should see some nice reviews very soon. It will be especially interesting to see the NEX 7 results, as it doesn’t use a translucent mirror and thus should be able to take full advantage of this amazing sensor.